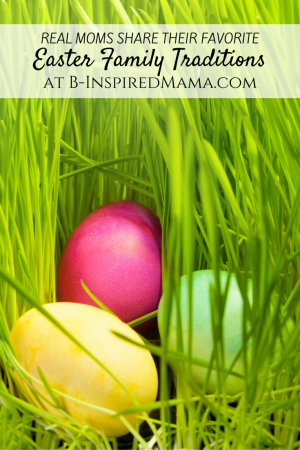 A Fun & YUMMY Easter Craft for Kids! 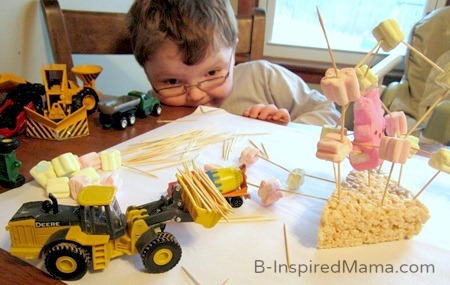 The concept of using marshmallow and toothpick to create sculptures is nothing new. I’ve seen it before here and here. And it’s really cool, but I’ve actually never done it with the kids. Until I saw these awesome flower-shaped marshmallows in the Easter candy section at the dollar store. 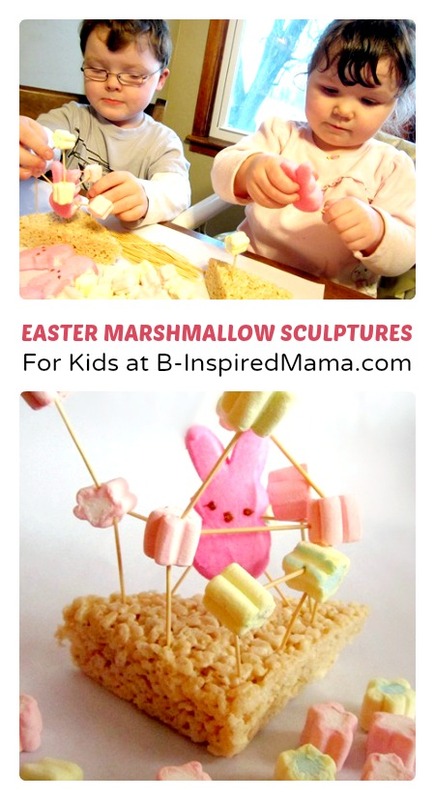 Throw some bunny Peeps in there and a rice crispy treat for a base, and you’ve got a yummy Easter craft: marshmallow sculptures! The kids “ate” this right up. (Both figuratively and literally!) Sawyer learned really quickly that bracing things in a triangle shape helped to add support while creating height. Future engineer like his uncle Josh, maybe? Sawyer played with these materials for hours. Of course he couldn’t resist getting his construction equipment in on the building process! 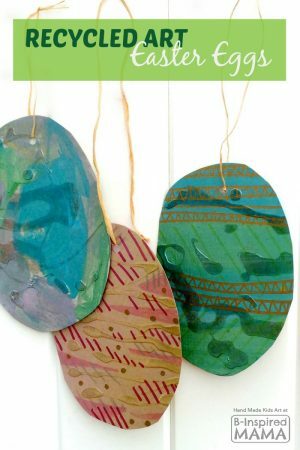 Have you ever done an Easter craft with candy? I’d love to hear about it in the comments below! Ohhh yet more stuff that we can't get hold of easily and I want. But what a great structure out of marshmallows that your little boy created. oooohhh I want some of those flower marshmellows! such fun! And I know a little boy who would loves to get his “mighty machines” into everything! Great fun! Thanks for sharing. I love the idea of using a Rice Krispie treat as a base!! Looks like a ton of fun! The addition of the peeps and flower marshmallows really does up the charm! Great idea to use Rice Krispie treats as a building base, too! What a fun activity! Thanks for sharing with Tuesday Tots! You're welcome! I love your blog and link up. 🙂 BTW, the marshmallows were actually kind of weird tasting I thought. Must be the kids agreed, because they really didn't eat too many. Now the peeps – those were yummy! So fun and easy. We will try it. Thanks for a great idea!